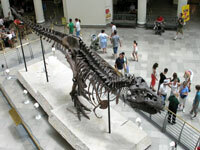 Chicago's wildly popular Field Museum of Natural History in Lake Shore Drive is home to 'Sue', the largest and most complete Tyrannosaurus Rex fossil ever found. The dinosaur came to rest here after being unearthed in South Dakota when the museum bought her remains for more than $8 million. Sue is just one of the draws to the museum. It offers other marvels like getting a bug's eye view in an underground adventure; descending into an Egyptian tomb; watching a glowing lava flow; and getting up close and personal with the man-eating lions of Tsavo. The museum specialises in interactive and diorama-type exhibits across its nine acres of exhibition space, and is a must-visit for families on holiday in Chicago. Opening times: 9am-5pm daily, last admission 4pm. Admission: $24 adults, $17 children 3-11. Various ticket packages and concessions are available.